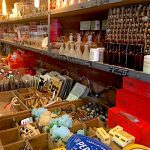 Upon walking through the flea markets of Clignancourt in Paris, one can easily observe that these markets attract a plethora of venders as well as consumers. One might also observe the consumption of deception, as in a tool used to the advantage of venders to sell objects of no or little value to consumers that will fall into the trap, and sometimes willingly. For example, two identical maps of the United States, yet one is labeled as the US in 1860 priced at 40 euros, the other labeled as the US in 1891 priced at 30 euros. The map can very well be one of the US in the year 1891, but it is completely incorrect for the year 1860, funny enough that the one that claims to be ‘older’ is the one that defies historical facts.